I was able to take a free class at Dance House Fitness last weekend (thanks Houston Tidbits Frontrow!) with my dear friend. We got a decent work out in and some good laughs as I made a valiant effort to move my body to the instructions. Lord help us all...I love to dance and especially to hip hop music, but I am not coordinated enough to move to choreographed moves. I was also able to take a freebie class at Bar Method with one of my besties who was in town this past week in addition to spending some serious quality time with her after church on Sunday and Monday evening. There's nothing that girl talk cannot solve, am I right? I didn't snap any pictures though. =/ Neither of the two work outs are my go to types of work outs, but it is fun to mix things up a bit, especially if the class is free! You can find a navy, floral version of it here. You can view fun summer wedge options here. 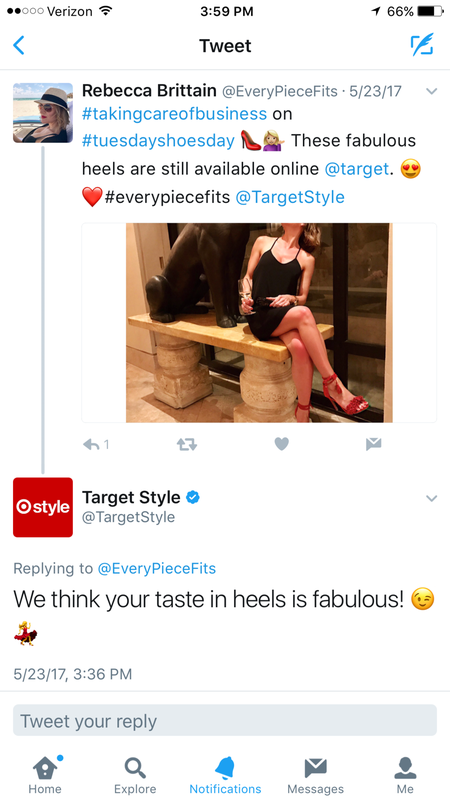 I mentioned last Friday on my blog's Facebook page that Target shared my Instagram post (again) about the Mossimo heels I cannot get enough of! While this may seem silly to some, it really excites me. My small, but growing blog could use any and all help in reaching others so to have someone sitting behind Target's social media app viewing my post and sharing it on their Awesome Shop site means a lot to me. I've suggested these Mossimo Irene Ghille heels no less than 100 times since I discovered them in February and they're still available and still worth every penny. Ann Taylor is having a great sale on their sale items - 40% off! I started to look and this outfit combo is now stuck in my wishful mind. I paired the Ann Taylor outfit with super cute and affordable shoes from Target and accessories from other places. I need. I want. I can't (for 13 more days). What were the highlights of your past week? Comment below! I hope everyone has a wonderful weekend and stay tuned because I will be announcing a new raffle giveaway soon!